- "No Time" by Frente! Cathy shows Rick a bank book with $2k in it, but he's not to use it unless there's an emergency. Phoebe lets Russell in the house to collect his things and he turns violent. 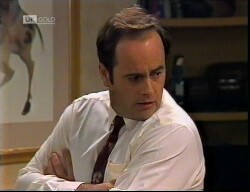 Michael is arrested in Number 26; Phil wants to know who dobbed him in. Michael is being walked down the steps by two policemen. Phil tells Helen to call Philippa Dunbar and tell her that Michael needs legal help. Hannah is hiding in a bush with her bike and she watches as Michael is put into the police car. HELEN: I'll be back here after I've told Julie what's happened. PHIL: You needn't trouble yourself. I'm pretty sure she knows exactly what's happened. HELEN: Philip, I'd rather make certain! PHIL: Of course she does! Who do you think called the police? PHIL: It looks like she's finally got her own way. I'll deal with her when I get back. Phil gets into the police car and Helen sadly watches as it pulls away. Hannah emerges from the bush and silently hugs Helen, who tells her everything will be ok.
Russell is looking out of the window and watches as the police car drives off. He is relieved - he thought Phoebe had called the cops. Russell is angry that he had been kicked out and he is extremely threatening in his manner. He tells her that he is part of the family and he can come and go from the house as he pleases. He takes the new key out of the lock and pockets it. The phone goes and Russell stops her from answering it. RUSSELL: Whoever it is, they're not going to be able to help you. You have to be punished for what you've done, Phoebe. No one's going to save you. The phone continues to ring out. Stephen is on the phone - it's obviously him calling Phoebe. Rick sits with Debbie, and they discuss his windfall. Debbie thinks he should use it only for emergencies, but Rick thinks it's going to waste in the bank - and anyway, he's not planning on having any emergencies! DEBBIE: What happens if you spend all of the money and next week you get hit by a truck or something? RICK: Well, I'd think, hey, lucky I spent that money whilst I had time to enjoy it! Rick thinks he needs a new stereo system but Debbie isn't impressed. She reminds him that Cathy will put another $2k in his bank if the original $2k is still there at the end of the year. Rick says he's starting work today, so he'll be able to put it back in out of wages. Debbie warns him that the job sounds like hard work and he might not like it, particularly with school on top. Rick says it sounds like a breeze - he's got accommodation at Lassiter's, he'll get fed and he reckons once the evening rush is over, he'll be able to study - and get paid for it! Debbie thinks it sounds too good to be true! Rick takes her off to show her around the kitchen and then to go shopping. Helen's arrived to tell Julie about Michael. Julie was in the back and didn't see the police car. Julie is worried about Phil and Helen tells her that he's upset. HELEN: What's more, he's so distressed that someone in the street must've put Michael in. JULIE: Only Philip would find that surprising, considering the number of people around here with good reason! HELEN: Still. Reporting him to the police is rather extreme. JULIE: Someone obviously didn't think so! Hannah asks Helen what will happen to Michael, and she wonders if he'll go to jail for a long time. Helen says that he's too young to go to jail - at worst he'll be sent to a juvenile detention centre, but first a magistrate has to decide if he needs to be punished first. JULIE: Of course he should be punished but I'll bet you anything he's not! He'll put on his 'child from a broken home act' for the court and they'll fall for it! He'll get a token slap on the wrist and before you know it, he'll be back making life miserable again for all of us! Phoebe tells Russell that she and Stephen didn't want to hurt him but he's impossible to live with. RUSSELL: You changed the locks, how should I feel?! I wanted to be friends. It was your decision to become enemies. Now you deserve everything you're going to get. RUSSELL: AFTER ALL I DID FOR YOU! I kept you company. I helped you with the housekeeping. I even bought clothes for Hope! I didn't have to do any of that you know! Russell is raving about how he's a writer and how a writer needs somewhere to live where he's wanted. Hope starts to cry. Phoebe craftily asks Russell to get Hope's formula from the kitchen whilst she changes her. RUSSELL: You see! You still want my help! Well forget it - no way! PHOEBE: It's not for me, it's for Hope. I thought you cared about her. I thought you wanted to be part of the family? RUSSELL: I am part of it. I've got nothing against Hope. Phoebe tells him where the formula is and Russell goes off to get it. Phoebe picks up Hope and runs out of the front door. Russell comes out of the kitchen with the bottle but he's too late. He slides down the front door, clutching the bottle. The Head Chef is having a go at Harvey for parking his car in his space. He doesn't want to listen to Harvey's explanations, putting Harvey in a bad mood. Rick walks in with a new television that he's bought. He puts it to one side whilst he shows Debbie around the kitchens. He's got a good feeling about the job. Harvey wants to know what Rick's doing in the kitchen and Rick introduces himself. Harvey is quite disdainful and tells him to start skinning onions, followed by three bags of prawns that need peeling and veining and warns him that he's got plenty more disgusting jobs for him to do when he's finished. Debbie laughs and leaves. Julie is watering some plants. PHIL: Well, I guess you're happy now. JULIE: If you mean about Michael, I can't pretend I'm sorry. He brought it entirely on himself. PHIL: Yes, I knew you hated him but I never thought you'd go this far. JULIE: What are you talking about? I'm not the one who reported him, if that's what you're thinking. PHIL: What the hell else would I think?! JULIE: It wasn't me! I wouldn't do that! Not out of any love for Michael but because I know how much it'd hurt you. Philip! I didn't do it. PHIL: All right then. If it wasn't you, who was it, then? Phoebe walks in with Hope and tells Stephen that Russell is inside the house. Stephen is annoyed that she let him in, but she explains that she thought he would just get his stuff and leave. Phoebe is quite shaken and says that he was going to hurt her if she hadn't got away. Stephen tells her that she's safe now and says that the whole nightmare will be over. Rick's upset that he isn't getting a break and has to wash pots next. He scalds himself on the hot water. HARVEY: I see you're catching on Rick; you can't be as dumb as you look! Phil has called around to see Lou, who's in the middle of his evening meal. Phil apologises and then starts eating his food whilst they're chatting! PHIL: Why should anything be up? LOU: That look on your face would be a dead giveaway, even if I hadn't heard about Michael. PHIL: How did you hear about it exactly? 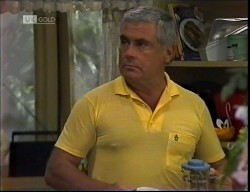 LOU: Mate, this is a small street - people notice when a police car pulls up outside somebody's home! Look, I'm sorry you're having this dumped on you but you've got to admit it, it was fairly inevitable. PHIL: The other day you said that if we weren't mates, you would have told the police yourself. PHIL: You didn't change your mind about that? LOU: I didn't dob him in if that's what you're thinking! I thought it, like I said, but I wouldn't do that. Phil is puzzled - if Lou didn't dob him in and Julie didn't dob him in, who did? Lou suggests that the cops could've just been looking out for him but Phil is confident that someone dobbed him in. LOU: Mate, let's face it, Michael is not exactly Mr Popular. There's a lot of people out there be glad to see the back of him. PHIL: Yeah, I know. I just didn't think there were that many around who would actually do something about it, though. LOU: Phil. It only needs one. Speaking of it only taking one, Russell is listening to loud rock music, whilst reading a sci-fi novel. Stephen and Phoebe walk in with the police, and Stephen turns the music down. The police tell him that Phoebe has accused him of physical assault amongst other things. POLICE: Do you deny it, Sir? RUSSELL: Of course I deny it! STEPHEN: Oh, you lying pig! I can tell you, if you'd hurt her, I wouldn't have called the police - I'd have broken your neck with my own hands! The policeman pushes Stephen back and tells him that they'll deal with it calmly. 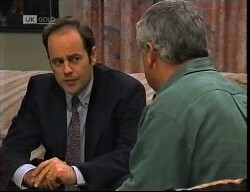 He tells Russell that Phoebe said he forced his way in and then attacked her. RUSSELL: I don't have to force my way in! I'm a tenant. I've got a key! Stephen explains that they tried to evict him but he keeps forcing his way back in. Russell admits that he's been served with an eviction notice, but says he's got four weeks of appeal and he doesn't know why he's been served - he doesn't owe them any rent. The police look at the door, and see that there's no evidence of a forced entry. Phoebe concedes that he tricked her, rather than forced entry. She tells them how he put his hand over her mouth and grabbed her, but Russell says she's lying and points out how she doesn't look as though she'd been attacked. Russell keeps twisting the story and Stephen flips. STEPHEN: Oh, you mongrel! You're not going to get away with this! The policeman holds Stephen back again and tells him to calm down and wait for the courts to decide on the tenancy dispute. The policeman says that without any proof, he can't do anything else. Russell smiles. Rick accidentally pours all of the stock away - he thought straining it meant pouring it down the sink. RICK: You didn't say keep it! HARVEY: I didn't know I was talking to a complete moron! Harvey tells him that he needs to learn some basics fast, or he'll be out of a job. Harvey gives him some food - it's prawns, and Rick's already sick of the sight of them! Julie and Debbie are trying to do schoolwork but Debbie can't concentrate as she's worried about Michael. Julie says that he's safer behind bars than he was when he was roaming the streets of Sydney. 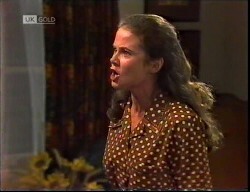 Debbie is annoyed, but Julie points out that the situation is entirely of Michael's own making. She says she won't lose any sleep over it. Hannah wanders in from her bedroom, dressed in her pyjamas with her stuffed toy. She announces that Phil's home, and Julie isn't impressed that she was up and looking out of the window when she was supposed to be sleeping. Phil says he's been walking around outside, trying to clear his head. Julie offers him some food but he says he's not hungry. He picks Hannah up and sits with her on his lap. DEBBIE: You look tired, Dad. Did you find out who ratted on Michael? PHIL: Well, it was none of the people I expected it to be. It must be someone I hadn't thought of. Who hated him enough to do it. Hannah looks very solemn. Debbie asks what happens next and Phil says he'll have to see what he can do to keep Michael out of a detention centre. Phoebe and Hope have stayed the night with Lou. Stephen has come over - he stayed in 30 with Russell to make sure he didn't do anything to the house. Phoebe says she won't take Hope back until Russell's gone and Lou says she can stay as long as she likes. Stephen warns that legal proceedings will take too long and he's intent on getting him out of their lives. Russell is eating breakfast. He looks at the books on the bookcase and then answers the phone. It's Dorothy - and he turns all of the photographs face down as she's speaking. He says that she can't speak to Stephen and Phoebe because they don't live there anymore! Michael is in a small dark room, sat at a table. Phil sits opposite. Phil tells him he's left clothes for his court appearance at the front desk, along with some antibiotics. Michael says he's got some already - the police doctor gave them to him. Phil says he tried to find out who reported him but to no avail. Michael laughs - the cops know all about him passing out on the porch and his time in Sydney, so it must've been Julie. PHIL: Julie's assured me it wasn't her. MICHAEL: Well what else is she going to say? Geez, Dad, aren't you ever going to wake up to her?! Debbie wanders in looking for Rick but Stephen is distracted. Stephen points out where Rick had been sitting, but he's slumped on the floor. Debbie wakes him, thinking he watched the television too much last night. He shows her his hands - they're burnt and cut - and he asks for her homework because he hasn't had time to do his. The job is miserable and Harvey is a slave driver - Rick's never worked so hard in his life - he thinks he's lost 10 kilos in sweat! Debbie suggests that he tells them to shove it, but Rick is staying in Lassiter's Staff Quarters - if he doesn't keep the job, he'll be homeless. Hannah is leaning against the hall wall, listening to Phil and Julie argue in the living room. Phil is extremely angry and the two are screaming at each other. PHIL: MICHAEL IS RIGHT! THE POLICE HAVE INFORMATION THEY COULD ONLY HAVE GOT FROM SOMEONE IN THIS FAMILY! JULIE: I don't believe you're still accusing me. I TOLD YOU I DIDN'T DO IT! PHIL: I don't know what else to think! NOTHING ELSE MAKES SENSE! JULIE: I don't care what makes sense, PHILIP! THE FACT IS I HAD NOTHING TO DO WITH IT AND I DON'T APPRECIATE YOU CALLING ME A LIAR! PHIL: OH, YOU THINK I LIKE THIS?! JULIE: -EVEN FROM BEHIND BARS! Hannah walks into the living room and joins in the screaming! Phil and Julie are both still furious, but they stop arguing and speak more calmly to Hannah. They both stand on opposite sides of the room, both with their hands on their hips, facing away from each other. PHIL: Oh, it's all right, Hannah. We're not really fighting; we're just a bit upset. HANNAH: It's not. It's my fault you're yelling at each other. PHIL: Of course it's not, darling! HANNAH: It is! I told the police on Michael. I'm sorry. Phil turns to face Hannah - he is stunned.